At full strength, the deep umber of our Enviro-Friendly Brown Iron Oxide is useful for warm shadows and dark values. Mixed with water, a brilliant granulating wash displays warm cinnamon tones with a darker pattern of granulation. Enviro-Friendly pigments are reclaimed and refined, giving you an earth-friendly option without sacrificing color quality. 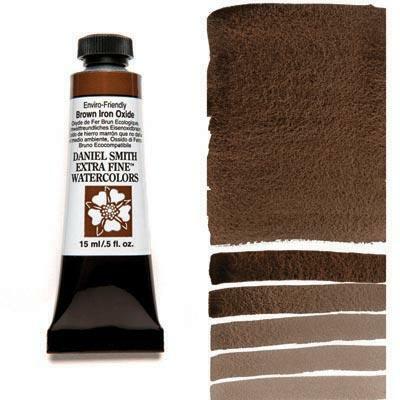 DANIEL SMITH Enviro-Friendly Watercolors-the colors aren’t green, but the process is! To make these paints, we use pigments from the earth’s crust, obtained through a process known as Iron Oxide Recovery (IOR). This method removes colored iron oxides that pollute mine water, cleaning the water so it can re-enter a receiving stream-and resulting in a cleaner natural environment. The recovered iron oxide is thoroughly washed, then used to create a trio of rich colors ranging in tone from a warm golden yellow to a deep red earth to a beautiful saturated dark brown with a bluish undertone.